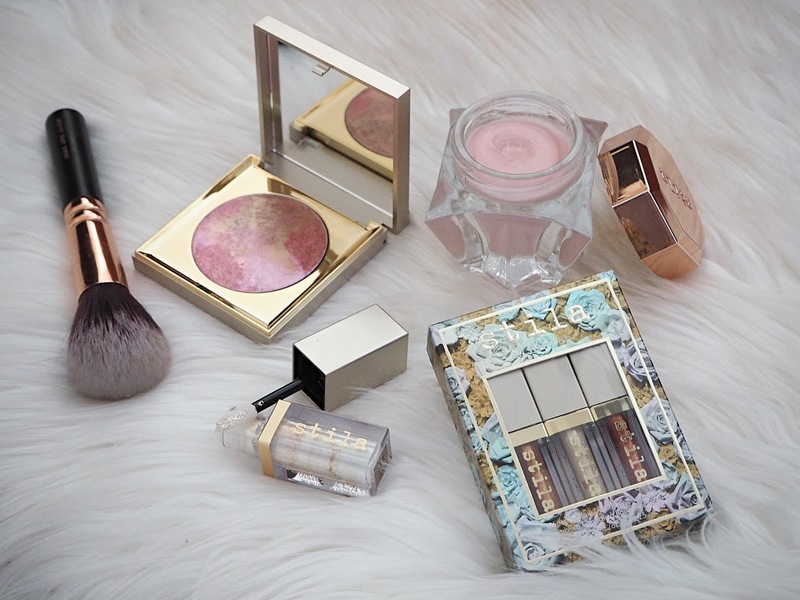 Highlighter is one of those beauty products that just brings me joy! I feel as though it's only really become a 'must-have' outside the beauty world over the past few years but now there are amazing options out there no matter what your budget is. Today I'm going to take you through both my favourite high-end products and my top affordable formulas. ColourPop Pressed Powder Highlighter Compact in Bae Area | $8 | This is such a lovely formula (though I didn't find the other shade from this range I tried to have as nice of a consistency) - it's free from glitter and very smooth. It gives a gorgeous metallic sheen and goes on beautifully. The colour itself is a sun-kissed golden-bronze with very slightly rosy-amber undertones. It actually reminds me a lot of the Make Up For Ever formula that we'll cover off shortly! Elf Studio Baked Highlighter Apricot Glow | £5 | This is a bit of a funny one because it actually has a glittery spray-over, so I'd recommend just swiping the top layer off with your finger! However once you get to the actual product, it's a lovely soft, natural highlighter that leaves a gorgeous sheen on the skin. I absolutely love this colour - it's so unusual. It's a warm golden peachy colour that I really like against my skin tone. Milani Strobelight Instant Glow Highlighter in Sunset Glow* | £12.95 | This is on the more expensive side of the affordable edit, however I honestly think this formula stands up against the high-end ones in my collection. It gives a highlight that's soft and metallic in appearance but still gives a stunning finish. The shade is also a beautiful colour that's quite hard to describe - I'd call it a gold with warm ambered bronze undertones. ColourPop Super Shock Cheek Highlighter in Dreamcatcher | $8 | This shade is out of stock at the moment, however there's a huge range on the ColourPop website for just about every skin tone. It's such a unique formula, a sort of cushiony mousse-cream that I apply with my fingers, dabbing it on and blending it out. Dreamcatcher is a stunning, unique colour; a light frosty gold with a pink duo-chrome sheen. No7 Instant Radiance Bronzing Highlighter | £10 | I don't know why this is so underrated! It actually comes in a light pinky-champagne colour too but this shade is perfect for my skin tone. I tend to swirl my finger on the surface to warm the product up a bit and dab it on with my fingers. It just has this gorgeous, soft pearly sheen that pictures don't do justice! It's a pretty bronzed gold colour that's not orange in the slightest. Make Up For Ever Pro Light Fusion in 02 Gold* | £28 | I love these sorts of light warm gold highlighters and I think this is one of my favourite formulas! It's just so buttery smooth and goes onto the skin so naturally (instead of sitting on top of it or emphasising imperfections) whilst giving that intense glow. Becca Shimmering Skin Perfector Pressed in Gradient Glow | £32 | This was actually a limited edition shade, however I still wanted to feature it because it showcases five of Becca's best-selling highlighters and I truly think their range has something for everyone. The formula is my all-time favourite - it's almost not like a powder, because the texture is so smooth. It has a dewy, glitter-free finish that seriously packs a punch. This is a really pretty champagne-rose colour. Jouer Powder Highlighter in Skinny Dip | £19 (for full size) | If you're a fan of intense, blinding highlighters the you'll love Jouer's formula! It does have a bit of glitz to it but it's very fine and doesn't impact on the smooth consistency. This is a pretty, very warm-toned peachy champagne. Cover FX Custom Enhancer Drops in Rose Gold* | £34 (for full size) | I'm a big fan of liquid illuminators - they can be mixed in with foundation for a subtle boost of all-over glow or applied with a damp makeup sponge over your base to give an intense look. Cover FX kind of started this trend and the shade Rose Gold is my favourite from their range. A lot of these kinds of products have a silvery tone to them but this doesn't - it's a gorgeous warm rosy copper colour. Iconic London Original Illuminator* | £30 | This is another liquid formula which really is like gorgeous molten metal! The colour is a sort of champagne with a silvery sheen running through it. Again, you can mix it with your primer or foundation or use them as a traditional highlighter. The colour of this against my skin tone means it gives a really intense look, so I use it quite a lot for nights out. What are your favourite affordable and high-end highlighters? That Melani highlighter looks absolutely gorgeous! Love how well these swatch! The Makeup Forever highlighter is just stunning! 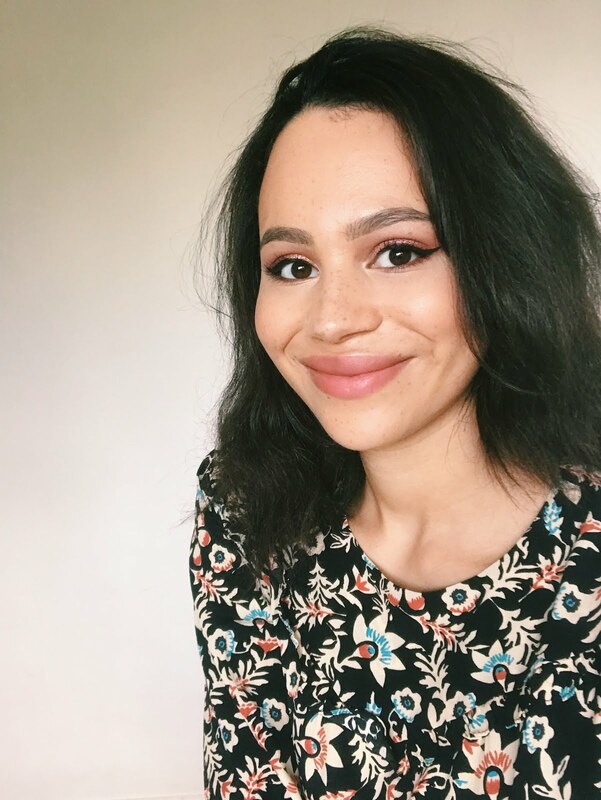 The Jouer Powder Highlighter formula is one of the most recent additions to my collection but became an instant favourite for me - I love how it makes the cheeks gleam! Love the MUFE formula too - it really does mesh with the skin beautifully. I love highlighters but surprisingly I dont own many at all. The elf ones look so pretty and are so affordable too. My all time favourite highlighter is the balms mary-lou manizer! 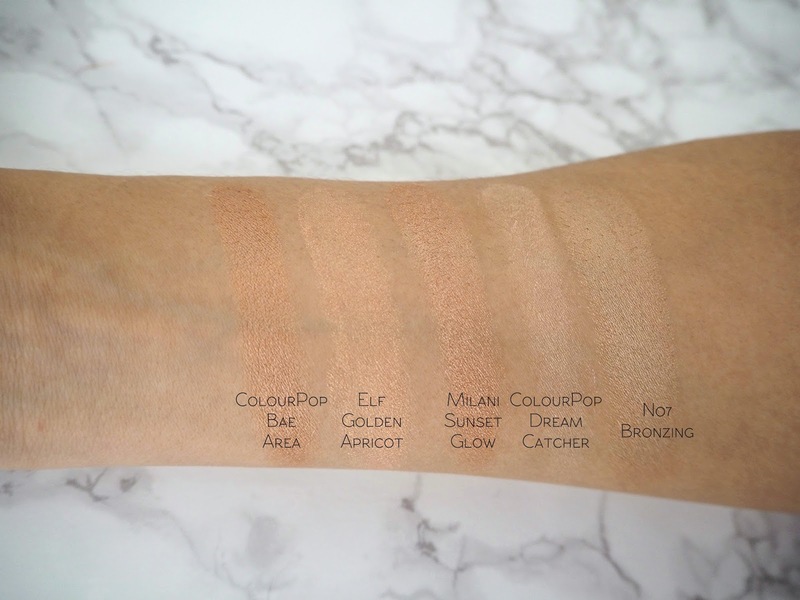 That No7 Bronzing is gorgeous! 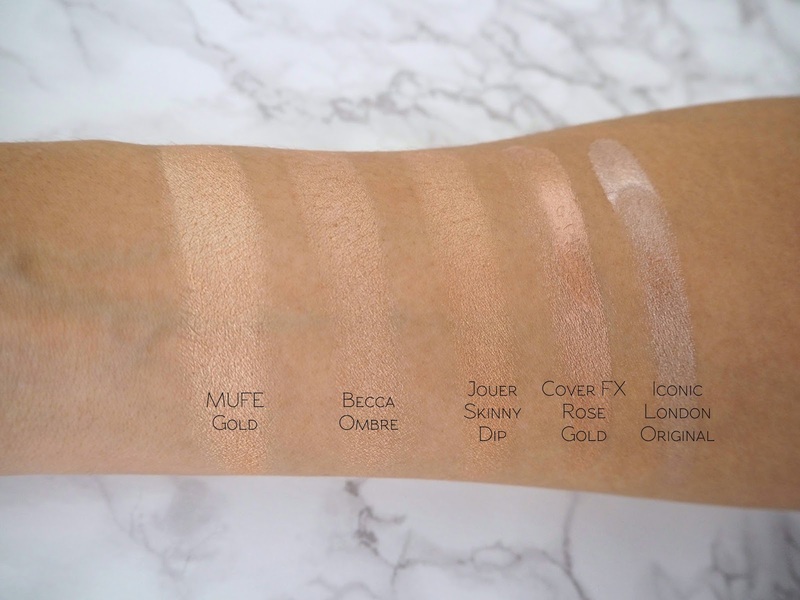 I really want to try some more liquid highlighters, the Iconic and Cover FX ones are both on my list Love that MUFE shade, really need to try them! I have to get my hands on the Iconic Illuminator Drops soon, everybody seems to love them! What a delightful post! 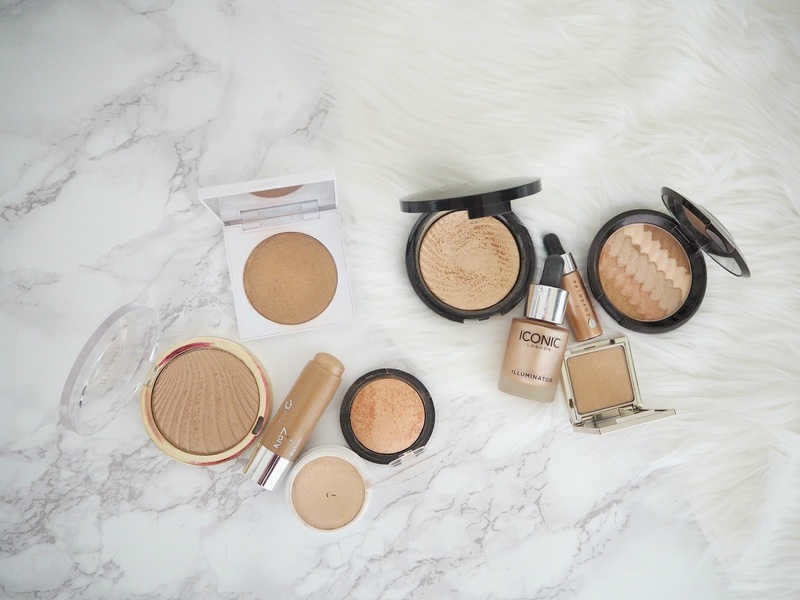 I love highlights and my favourite of all time is Becca Champagne Pop as it's just gorgeous. The Elf one looks really appealing here also.